Add flavour, colour, texture and functionality to your bakery items with Carroll’s range of toppings and inclusions. Non Pareils (100s &1000s) add visual delight. Choose a single colour to create strong contrasts with the underlying icing, binary colours such as black and white to celebrate team colours, or multiple colours or rainbow blends for a truly festive effect. Decorating Pearls and Sugar Candy, in single or multiple colours, add extra appeal. Decs and Chocolate Sprinkles provide yet another look for the decorator, either in single or combination colours. For the more adventurous, mix it up with some Decorating Pearls or 100s & 1000s. Starting at the base, we have the perfect biscuit crumb in vanilla or chocolate for your cheesecakes. See our biscuit crumb range. Chocolate Flake can add extra texture and flavour to cheesecake toppings as well as creating visual impact on the outside of cakes. Decs or Sprinkles in standard or natural colours are perfect partners for your donuts. Choose from a multitude of colours, create your own mix or use one of our popular rainbow blends. Fat-coated options are available to minimise any colour bleed issues on your icing. Ask about our high end sparkle/glitter Decs in gold and silver – perfect for a special occasion or corporate event. 100s & 1000s are also a natural with donuts. Single colours or rainbow mixes are available. Don’t forget to try our festive colours, always popular at Christmas time. Fat-coated options are available to minimise colour bleed. 100s & 1000s can be used either as a post-bake topping or as an inclusion. If using 100s & 1000s as an inclusion please do talk to us about which colours are ‘bake stable’. Decs and Sprinkles are very versatile as toppings. Talk to us about your needs for any customised sizes or colours. Chocolate and vanilla biscuit crumbs could be perfect for your fudge squares. Or what about a chocolate biscuit crumb for that slice or bar topping? Candy pieces such as fudge chocolate or coconut could add extra interest and texture to your biscuits or bars. Ask about our bake-stable options. Hokey Pokey pieces are great as a chunky inclusion, especially with our bake-stable formulation. Make ice cream products even more appetising with our irresistable range of toppings and inclusions. Chocolate Sprinkles are the natural choice with soft serve ice cream. They deliver real chocolate flavour and great contrast on snow-white soft serve. 100s & 1000s on soft serve ice creams are almost as iconic as they are on Fairy Bread. For special events why not consider a single colour or combination such as red and black to support your favourite sports team? Standard and natural colours are available. 100s & 1000s, Decs and Sprinkles are perfect serving complements for your favourite ice creams. Mix it up, or add those sprinkles to a chocolate dip topping for extra colour and interest. For ice cream bars and serveries we have a superb range of toppings and inclusions, such as Choc-O-Lot, an indulgent combination of chocolate chips, honeycomb and dark fudge pieces. Don’t forget about chocolate biscuit crumbs and tangy candy pieces with a tingle of sherbet fizz. Candy & Fudge Pieces. We offer a great range of inclusions from fudge chocolate, coconut fondant and crunchy meringue pieces, through to tangy inclusions such as lemon, orange and lime with that extra burst of acid sour or sherbert fizz. Available in 4-7mm, 7-10mm kibble or 10mm plus chunks. We can also provide them chocolate-coated for extra variety. Hokey Pokey – our very own version of the iconic Kiwi favourite. Simply fabulous when chocolate-coated and really crunchy. All natural flavour and colours. Chocolate biscuit crumb is perfect for cookies and cream. We can also offer other flavoured biscuit crumb – let us know what you’re looking for. MOQs will apply. Our toppings and inclusions provide a fantastic extra dimension to confectionery. Enjoy more crunch and flavour, real taste appeal and a visual feast. Candy pieces. Make the most of flavours such as hokey pokey, honeycomb, meringue, coconut fudge, chocolate fudge, lemon, citrus or raspberry flavours with that extra ‘zing’ and crunch. 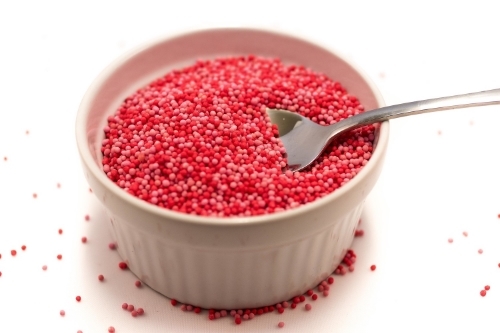 Chocolate Sprinkles are great on chocolates and truffles. We can even customise a very fine chocolate sprinkle that’s perfect for rolling and coating your truffle balls. Flavoured Decs such as banana or strawberry are another tasty option. 100s & 1000s – from the classic chocolate drop or ‘Freckle’ with a lavish coating of rainbow 100s & 1000s in standard or natural colours, or in exotic and gloss colour combinations of gold over black, or midnight purple Non Pareils with a deep midnight purple lustre. 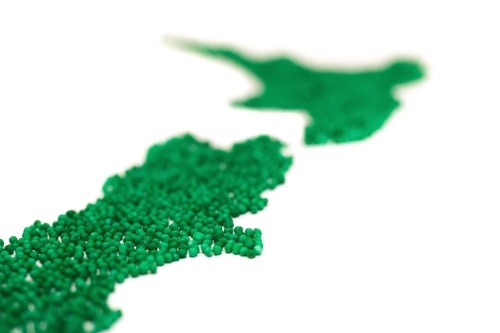 Liquorice aniseed drops wouldn‘t be complete without their coating of 100s & 1000s? Chocolate or Vanilla biscuit crumb could be the ideal inclusion for your nougat range or ‘cookies and cream’ confection. Talk to us about our other biscuit crumb flavours. Insist on New Zealand-made – it can be a real plus for your marketing. Why take the risk of foreign imports when you can get the best locally? Companies, sports clubs and charities are always looking for ideas to celebrate an event, launch a new product, raise funds or promote their organisation. Custom-made confectionery can provide the perfect marketing tool. Our toppings have strong visual appeal, and our vast range of colours means products can be be easily matched to your corporate or club colours. From the traditional cake stall to branded biscuits and chocolate bars – food is a proven fundraising vehicle. Just imagine your club selling liquorice aniseed drops with your team colours. Give us a call to discuss your ideas. For custom projects like this, MOQs will apply, but if your target is to raise a few dollars then volume will hopefully not be an issue. Business brands invariably have a distinctive colour palette. From banks to cinema chains – each company has a look that can be easily extended into sweet promotional items. Creating food novelties branded with your corporate colours can be a great way to impress your target market. Bounce your ideas off us – we’d love to hear them. Our toppings can be custom-blended to complement event themes. Whether you’re offering donuts, cupcakes, iced biscuits, ice creams or confectionery – our range of toppings will add extra visual appeal. Christmas or Festive – traditional green, red and white. These can be custom-blended with our 100s & 1000s, Decs or Sprinkles, or decorating pearls. Easter – pinks, yellows. Why not decorate some eggs in these traditional colours? Mother’s Day – pinks and whites. Halloween – orange, browns and blacks. Chinese New Year – reds and golds. High gloss and pearl finishes are a must.